Nicknamed "Easy Ed" he was one of the very first superstars for the Boston Celtics. 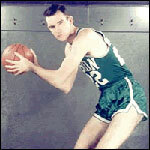 Ed MacAuley played six seasons (1950-56) with the Celtics and was an all star in all six seasons. Also with the Celtics, MacAuley was a member of the All-NBA first team three times and was the 1951 Most Valuable Player in the very first NBA All Star game scoring 20 points, which was played at the Boston Garden on March 2, 1951. He had his Celtics No. 22 retired on October 16, 1963 at the same time with Bob Cousy's No. 14. They were the first two to have their numbers retired by Boston. Nicknamed "Easy Ed", MacAuley earned the nickname during his freshman year at St. Louis University when it was his turn to be captain for a game. St. Louis rotated captains every game and MacAuley was very nervous when his time came. The coach said I would be captain one night and all I had to do was lead us out of the dressing room then through a door, said MacAuley. Thats the only thing I had to do and I did it. I pushed the door open, ran down the other end with the ball and took a couple of shots. I turned around and nobody was following me and the reason they were not following me was because they were playing the National Anthem. I was so nervous I didnt even hear it. These days, Easy Ed, who turns 77 on March 22, resides in St. Louis, Missouri with his wife Jacqueline. The two of them have been married 52 years and have seven children and 17 grandchildren. MacAuley is retired and previously he was a Sports Director for two television stations in St. Louis. With retirement, MacAuley is currently very involved with his church serving as a Deacon and has written a book entitled Homilies Lives with Father Francis Fredle. The two have also started up the website homiliealive.com. MacAuley is a legend in St. Louis where he starred at St. Louis high school and went on to become a Hall of Famer at St. Louis University. In college, MacAuley was a first-team All-American and was named the Player of the Year in 1949. MacAuley played a total of ten seasons in the NBA. Prior to the Celtics, "Easy Ed" played one season in St. Louis and then after the 1956 season was traded back to St. Louis for Bill Russell. MacAuley played three more seasons before retiring and won an NBA title with St. Louis in 1958. I got a call from Walter Bown and he said they had a deal that would send me to the St. Louis Hawks, said MacAuley. When we were in Boston my son Patrick was diagnosed with spinal meningitis and we came back to St. Louis where he was under care. Easy Ed retired as the NBA's third all-time leading scorer trailing only George Mikan and Dolph Shayes at the time. MacAuley was inducted into the Hall of Fame in 1960 at the age of 32 and to this day he is still the youngest player ever enshrined. CURRENTLY: Retired. Serves as a Deacon for his local church and recently co-wrote "Homilies Lives" with Father Francis Fredle. Also helps run homiliesalive.com. CLAIM TO FAME: His No. 22 is retired by the Boston Celtics and was one of the Celtics very first superstars. HIGHLIGHT OF BASKETBALL CAREER: Winning the NIT tournament at St. Louis University, winning an NBA championship with the St. Louis Hawks and being inducted into the Hall of Fame at such a young age (32).